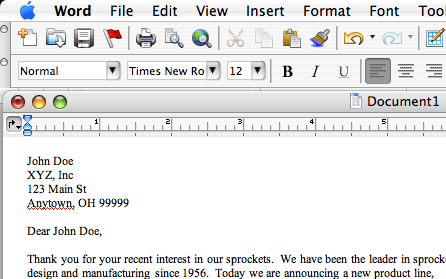 Microsoft Word for the Mac includes the ability to perform a mail merge (also known as a data merge). A mail merge is basically a form letter, with place holders for specific data such as name and address. 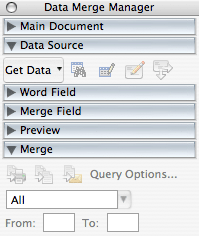 When you perform a merge, one copy of the form letter is produced for each record in a designated data source, with the place holders replaced with the appropriate fields from the data source. 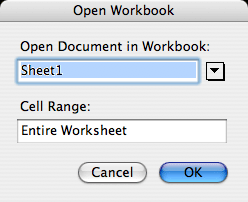 Unlike Word for Windows, the Mac version of Word does not support ODBC as a data source. 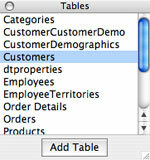 However, it does support Excel as a data source, and Excel supports ODBC. 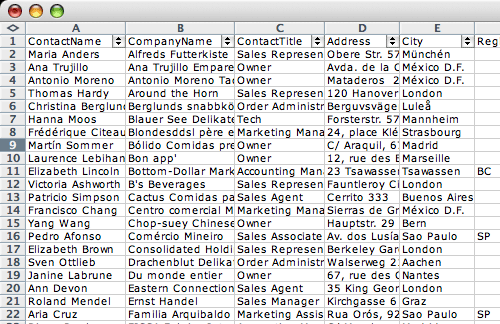 Therefore, we can use Excel as an intermediary between the ODBC source and MS Word. These instructions assume you have already downloaded and installed the appropriate ODBC driver for your database and you have configured a DSN (data source name). If you have not yet purchased a license key, you will only see the first 3 rows from any database query. Please contact us at support@actualtech.com if you have any questions or suggestions regarding these instructions. Let's assume that you will be creating a form letter to a list of customers. 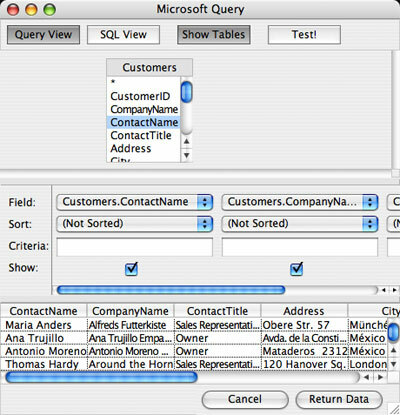 All the customer information resides in your sales database, which we will connect to using the ODBC connectivity of MS Excel. When you have selected your fields, you can preview the results by pressing the "Test!" button. When you are satisfied with the results, press the "Return Data" button in the lower right corner to return to your spreadsheet. Now save your spreadsheet file. You can update your spreadsheet any time with the latest information from your database by right clicking (control clicking) on your results within the spreadsheet and selecting "Refresh Data" from the menu. First, expand the Main Document triangle, click on the Create popup button, and select "Form Letters" from the popup menu. Expand the Data Source triangle, click on the Get Data popup button, and select Open Data Source... from the popup menu to display a dialog for selecting your Excel spreadsheet containing your customer data. For this example, just accept the defaults and press OK. 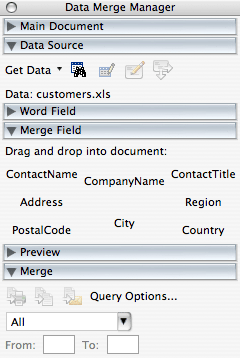 The Data Merge Manager will be updated to display the fields defined in your spreadsheet under the "Merge Field" heading. A document will be created with the form letter populated with the data from your spreadsheet. For each row in the spreadsheet, the form letter populated with the fields from that record will appear in a separate section (page) of the document. To learn more about MS Office database connectivity, please visit our MS Office Resource Center.